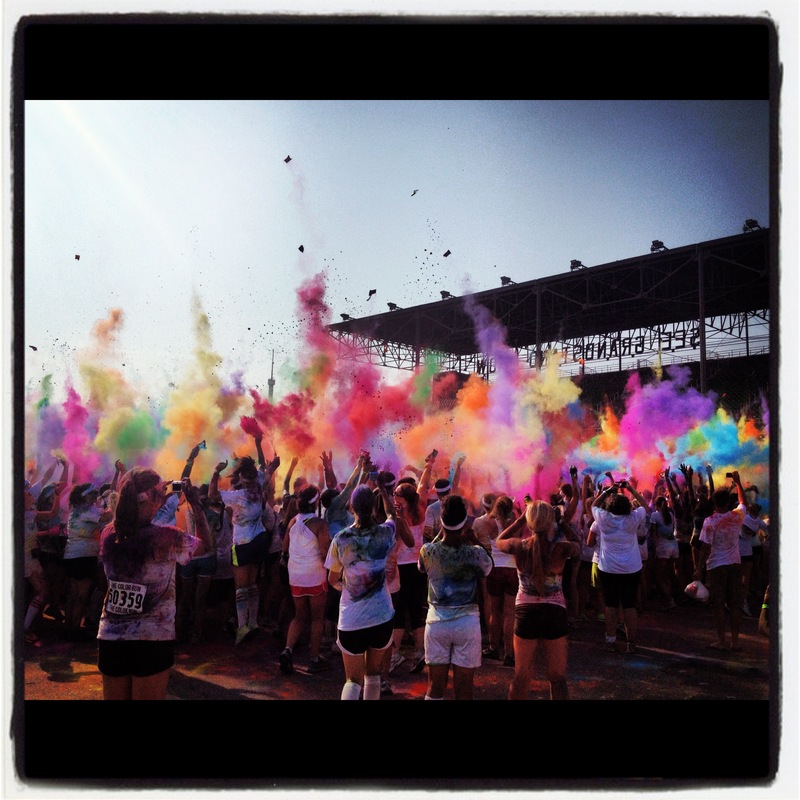 I spent my day in a cloud of color at The Color Run in Minnesota. If you think I resisted making “Purple Rain” jokes, you are mistaken. As a social media volunteer for Open Your Heart to the Hungry and Homeless, this meant running around with my iPhone, snapping pictures and tweeting and Facebooking and generally doing things that actually don’t look that helpful but hopefully are (awareness, you guys!). The event itself was pretty overwhelming. About 19,000 runners, starting out all in white and eventually turning into human canvasses, ran or walked the course. A portion of their fee was already given to Open Your Heart, but quite a few made extra donations at our booth. And a few of them apologized for the money being covered in color. That’s Minnesota nice for you. In preparation, I spent the past week thinking of color. Favorite colors (mine, obviously, are yellow and purple – SKOL Vikings), color quotes (“When in doubt, wear red.” – Bill Blass), color songs (“Lady in Red” is welcome to leave my head anytime now. Anytime. ), and color references in movies (“Buddy the Elf, what’s your favorite color?”). But after participating in the event, and knowing the good these donations will do – going towards the people who truly need them – there’s one song lyric I think sums it all up for me. Now, I recognize The War Was in Color is not about a war on hunger. But today was a day full of color – and a day to fight hunger. Let’s all enjoy our lives full of color.